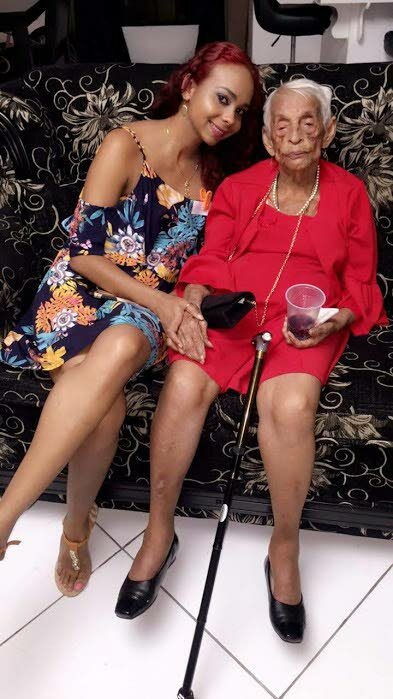 Centenarian Agnes Dolabaille Sunalee shares a special moment with her great niece, Jodi Dolabaille. Agnes Dolabaille Sunlee turned 100 on January 28 and celebrated the milestone with a weekend of events. She spent January 26 with her children, grandchildren, nieces, nephews, cousins and friends, bringing the the majority of her relatives together for the first time in years. Relatives also came in from Canada and the United States to share in the special celebration. Sunlee’s children hosted an intimate dinner with members of her immediate family at Jenny’s Ranch in Arima on January 27. The Arima resident, fondly called Tanty Agnes, Mam and Ma Ag, is the only surviving sibling of five children. She attributes her long life to her spirituality and her loving, giving nature. Reply to "Sunlee marks 100"